Description: Today, many evangelicals in the Russian-speaking world emphasize sanctification as a distinctive mark of their Christian faith. This is a unique characteristic, particularly in the European context. Their historic tapestry has been woven from a number of threads that originated in the second half of the nineteenth century. Missionary efforts of the German Baptists, a revival sparked by a British evangelist, and a pietistic awakening among the Mennonites in the South converged to form a tapestry that displays Protestant, Baptist, and Anabaptist heritage. Ivan Kargel uniquely participated in the formation and ministry of each of these threads. His life spans from Tsarist Russia to the Soviet Union. Kargel refused to adhere to a systematic view of theology. Instead, he urged believers to go to Scripture and draw from the riches of a life united with Christ. 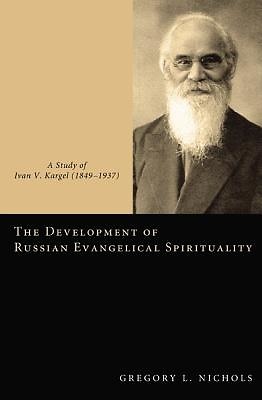 Kargel's influence today is keenly felt across the Russian-speaking evangelical world as they seek to identify the roots of their spiritual identity. This book examines the influences on Ivan Kargel and offers insights into how his life and work are expressed in the tapestry of Russian evangelical spirituality. Endorsements: ""The work not only provides an excellent biographical narrative of Ivan V. Kargel, an elusive yet seminal figure in the development of evangelical spirituality in Russia, but also a careful study of his theological thought. The work's comprehensive grasp of the evangelical movement as a whole, its meticulous use of sources in three languages, and its setting in the context of the times represent scholarship at its best."" -Albert W. Wardin Jr. Belmont University ""Ivan Kargel was the most important spiritual writer in the early years of the evangelical Christians-Baptists in Russia and Ukraine. Using previously neglected primary sources, Gregory Nichols has examined the variety of influences that formed Kargel's spirituality, showing in particular the significance of Keswick holiness teaching for this greatly respected author."" -David Bebbington University of Stirling ""Gregory Nichols's careful probing of the developing spirituality and theology of Ivan V. Kargel, who was both German and Russian, is an important contribution from an American historian-theologian who has earned the right to be heard. It will help shape thinking and discussion . . . Nichols's book earns him a respected place in ongoing theological conversations among current east European evangelical theologians. -Walter Sawatsky Co-editor of Religion in Eastern Europe ""Gregory L. Nichols has made a major contribution to our understanding of the theological development of evangelical faith in Russia . . . Thanks to this carefully wrought work we have the clearest explanation to date for the unique blend of holiness, pietistic, and Anabaptist strains in Russian evangelicalism."" -Mark R. Elliott Asbury Seminary About the Contributor(s): Gregory L. Nichols is Lecturer of Baptist and Anabaptist Studies and Church History at the International Baptist Theological Seminary in Prague, Czech Republic. He also lectured for several years at the Odessa Theological Seminary in Odessa, Ukraine.